Whither PDVSA? And its debt? This article is mostly a rehash of the same story I mocked here. It even quotes Luis Pacheco (aka Augusto Rodriguez? Ongoing chuckle for me…) giving the usual line about how nice it is to be in Colombia now. All good. Some former PDVSA workers are itching to return to Venezuela–but only after a regime change. “I would return immediately,” said Horacio Medina, a former PDVSA manager who negotiated contract agreements between PDVSA and private companies. Medina belongs to a new fledgling group called Venezuela and its Oil, which he said is made up of engineers, lawyers, and economists who dream of creating a new state-owned oil company to replace PDVSA, an institution so “destroyed” that “you can’t rebuild it,” Medina said in a phone interview from his home in Florida. People are out there bidding up Venezuelan bonds because President Hugo Chavez is sick with cancer, and they seem to think that an end to his presidency would reduce default risk. But now these folks are advocating to replace the state oil company and make a clean start. That raises some interesting questions about the PDVSA bonds issued under the current administration. This entry was posted in Uncategorized on July 4, 2011 by Steven Bodzin. La locomotora minera: Brutal ecocidio contra los colombianos . Translation: The mining locomotive: Brutal ecocide against the Colombians. And this video here, which arrived with a note saying it had been “banned by Colombian TV. This video rubbed me the wrong way. Climbing to El Alto from La Paz, Bolivia. Evo wanted this old bus off the road by 2018. Bus drivers said no. Going to La Paz, Bolivia, where the airport is above 4,000 meters and the main plazas are around 3,700 over sea level, you expect your lungs to suffer. (For those of you unfamiliar, 4,000 meters is about 13,200 feet.) After all, in a normal country, 13,000 feet is the top of a reasonably high mountain, rather than some river valley well below nearby peaks. So the lack of oxygen is predictable. But in spending last week in and around that city, I was unpleasantly surprised at how the political system and people’s values combine to make the air much more polluted than it need be. Bolivia is a poor country, even by the modest standards of South America. It is in boom, but almost no one has a private automobile. 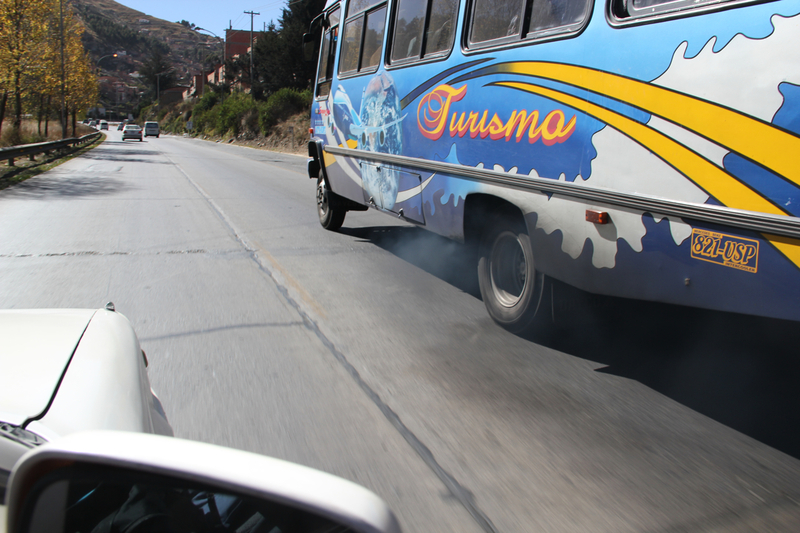 The pollution tends to come from wood smoke, fireworks and most of all, poorly tuned diesel vehicles. The government tried to raise fuel prices around New Years’. That would have given drivers of buses and trucks a financial incentive to replace old, poorly tuned vehicles. But the government did a lousy job of getting public support for the move ahead of time, instead trying to sneak the measure through over the summer holidays. Popular rejection was swift and brutal, led by the powerful bus drivers’ and truckers’ unions. The government soon backed off. This entry was posted in Uncategorized on July 3, 2011 by Steven Bodzin.